US AFRICOM, Israel, and Uganda’s Dictator-for-Life Yoweri Museveni set up in South Sudan, inflame conflict, push out China and prepare to take over oil. The SPLM has received support from the US and Israel throughout the duration of the civil war fought between southern rebels and Khartoum, which has historically had unfriendly relations with the West and has moved very closely to China in recent times to jointly develop the country’s oil wealth prior to the separation. Romantic notions for self-determination did not motivate the West to support southern secession; the objective was to partition Sudan and deprive Khartoum of economically relevant territory in the south where most of the oil fields lie. In exchange for the financial, material, political, and diplomatic support received from the West, the new government in Juba endorsed a ‘Faustian pact’ with its sponsors to open its economy to international finance capital and multinational interests. The government in Juba even applied for IMF membership before it had even officially gained independence from Sudan. Despite supporting the South’s independence with diplomatic muscle and military aid, the United States has been unable to gain a foothold in the country’s oil sector; Juba’s crippled economy remains dominated by Asian companies, primarily from China. South Sudan must rely on pipelines that run through Khartoum to export its oil, and the two countries produced around 115,000 barrels of oil per day in 2012, less than half the volume produced in the years before South Sudan’s independence. Both sides have nearly gone to war over disputed oil fields that straddle a poorly demarcated border. Judging from the poor economic performance of both countries since the partition and the dramatic loss of the life in the ongoing crisis, the experiment of South Sudanese independence is failing.. The piece would go on to note that peace deals reached leaving Sudan intact could have avoided the deadly conflict now raging – and that of course is correct. However, peace is not and never was the goal of the West and its involvement in Africa – economic gain is. Precisely because China still maintains extensive holdings in Sudan and South Sudan’s oil infrastructure, the conflict will be brought to a fevered pitch – and unsurprisingly the conflict’s epicenter corresponds with South Sudan’s primary oil producing regions. If and when the Chinese are pushed out of South Sudan, the West will continue either across the border to establish routes for exporting their newly gained oil wealth from the landlocked country, or proceed through Kenya with or without the current government in Nairobi’s backing. The stakes could not be higher for China, the largest investor in South Sudan’s oil sector, as fierce fighting continues between forces loyal to President Salva Kiir and those of his former deputy. Some of the largest oil fields China operates are in areas controlled by fighters backing Riek Machar, the country’s vice-president until he was sacked in July. Oil production has already dropped by 20% since the onset of the conflict three weeks ago and more than 300 Chinese workers have been evacuated. The spectre of their Libyan experience also weighs heavily on the Chinese minds – project after project now lies deserted because of heavy fighting during the Arab Spring uprising of 2011, inflicting huge losses on China. Most telling of all is the BBC’s reference to Libya – another nation destroyed by Western military aggression that saw both Russian and Chinese interests crumble overnight and replaced by Western corporations. While South Sudan’s chaos is being orchestrated more covertly by the West, the final goal of pushing out the Chinese and taking over is the same. Similar covert destabilization can be seen all across what the 2006 Strategic Studies Institute’s report “String of Pearls: Meeting the Challenge of China’s Rising Power across the Asian Littoral” calls China’s “String of Perals.” This includes US-backed militants attempting to carve off the province of Baluchistan from Pakistanwhere China has established a port at Gwadar and at another Chinese port in the state of Rakhine, Myanmar that has been the scene of brutal, genocidal violence carried out by “democracy icon” Aung San Suu Kyi’s “saffron monks” against Rohingya refugees. To be sure, growing pains are common in societies working to secure their independence after years of marginalization and authoritarian rule. Building a cohesive national identity among South Sudan’s 81 ethnic groups will take generations. Still, the looming specters of mass intercommunal violence means we cannot afford to be complacent. The United States committed itself to the South Sudanese people’s long march toward independence decades ago. It would be a shame if America allowed a return to war when the South Sudanese are so close to securing their future. With that humanitarian/freedom-promoting foot-in-the-door, the West has the pretext it needs to meddle for decades to come. To begin with, Israel Military Industries Ltd. (IMI) signed what it called a “water infrastructure and technology development” deal with South Sudan’s government in 2012. The deal allegedly covers desalination, irrigation, water transport and purification, but a visit to Israel Military Industries Ltd. website indicates they are military contractors and arms manufacturers, not engineers and certainly not specialists in water infrastructure. 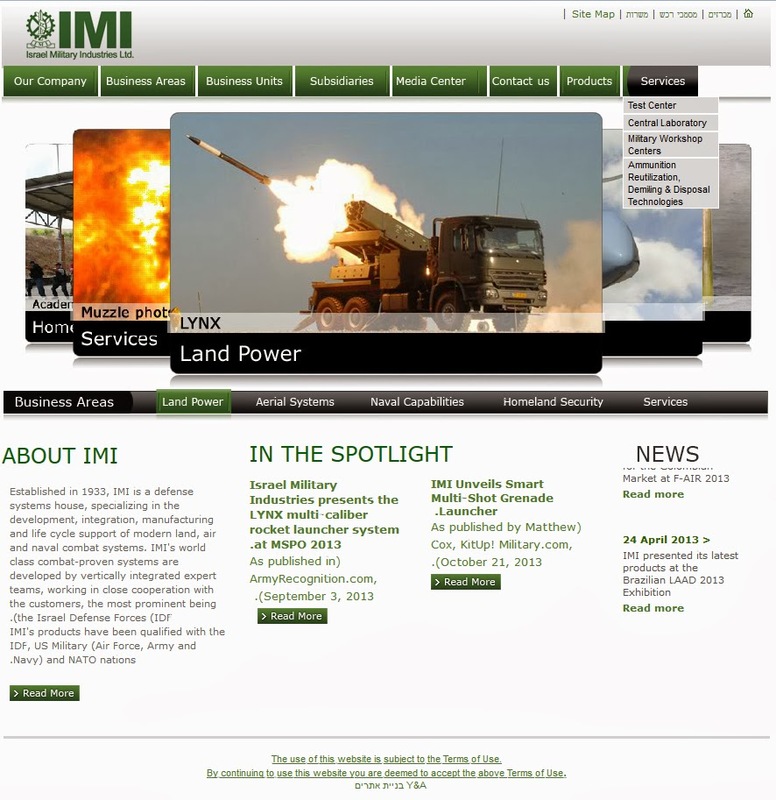 Other sources claim IMI will serve as a conduit for actual Israeli water firms – but in light of US, Israeli, Saudi, and Qatari joint operations elsewhere, IMI will most likely serve as a conduit for weapons, cash, and conflict as well (or instead). Image: It is not entirely clear how a military contractor and weapons manufacturer like Israel’s IMI is going to develop South Sudan’s water infrastructure. Just like Qatar’s use of humanitarian aid groups to smuggle weapons into Syria, Israel is most likely using “development” as cover for perpetuating conflict both within South Sudan to drive out the Chinese, as well as across the border in Sudan to the north to finally topple the government in Khartoum. South Sudan says it has signed an agreement with several Israeli oil companies, a potentially significant strategic move that will consolidate the Jewish state’s relations with the fledgling, oil-rich East African state. South Sudan’s petroleum and mining minister, Dhieu Dau, announced the oil deal last week after he returned from a visit to Israel. He said negotiations were ongoing with Israeli companies, which he did not identify, seeking to invest in South Sudan. Dau indicated the southern government in Juba, ramshackle capital of the infant state, hoped to export oil to Israel, but observed that this could not happen before March. He gave no indication how the landlocked south would achieve this, or what volume of crude would be involved. But it’s a move Khartoum would do everything possible to wreck. The prospect of Israel actually getting oil from South Sudan remains uncertain, given Juba’s difficulties with Khartoum. There has been talk of building a 1,000-mile export pipeline from South Sudan across Kenya to the Indian Ocean that would free Juba from reliance on Khartoum’s pipelines. But no definite plans for the project, expected to cost around $2 billion, have yet materialized. It may be that Israeli companies are seeking to help out in that regard — if only to undermine the Islamic-oriented Khartoum regime and its alliance with Tehran, and to gain access to the Nile River, Egypt’s primary source of water and a strategic target. During Sudan’s civil war, one of Africa’s longest conflicts in which some 2 million people died, Israel provided the southern rebels with arms, training and funding, as it has done in other parts of Africa seeking to weaken its Arab adversaries. Clearly, the presence of Israeli arms dealers is not to develop South Sudan’s infrastructure but rather to flood the region with weapons to flush out the Chinese and eventually stab northward toward Sudan and its capital of Khartoum. UPI’s report would go on to admit that military aid was still undoubtedly flowing to South Sudan for this very purpose. In addition to a proxy military confrontation with Sudan, the US, Israel, Saudi Arabia, and Qatar have been attempting to overthrow the government in Khartoum from within – attempting an “Arab Spring-style” uprising in late 2013 that eventually fizzled. Infamous Western collaborator and Ugandan dictator-for-life Yoweri Museveni has been fighting the West’s proxy wars in Africa for decades. He has also done much within his borders to appease the West including selling large tracts of land to foreign developers right out from beneath the feet of his own people – many times killing landowners who refused eviction. Image: Whatever pretext the West attempts to use to place Western troops inside of Africa while Fortune 500 corporations scoop up the continent’s vast resources, it is nothing more than modern recolonization. 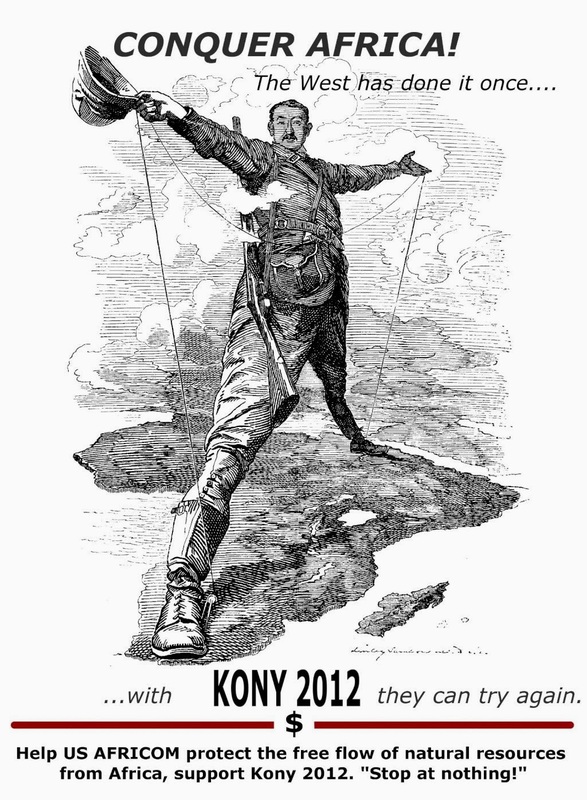 US troops placed in Uganda to fight “Kony” are now conveniently in place to aid in the despoiling of neighboring South Sudan – a state carved out of proper Sudan via Western-fueled civil war. Nonessential U.S. Embassy personnel were evacuated Friday from South Sudan aboard two KC-130 aircraft assigned to a Marine crisis response team positioned in nearby Uganda. Last week, the Special Purpose Marine Air Ground Task Force-Crisis Response also was pre-positioned at Entebbe, Uganda, to provide additional support. The unit, from Moron, Spain, was formed less than a year ago to bolster AFRICOM’s crisis-response capabilities. Uganda, like Sudan, has clearly been permanently brought into AFRICOM’s fold under an initial false “humanitarian” pretext that was then quietly shifted to the permanent occupation of African territory. And Uganda not only serves as a base for US AFRICOM, but is also using its soldiers to carry out AFRICOM’s objectives beyond Uganda’s borders. The South Sudan peace talks being held in Ethiopia have stalled, officials say, as a rebel commander claims big victories against the South Sudanese government and Uganda sends in more troops and military hardware. Uganda, he said, had sent 1,200 troops to secure installations such as the airport and state house, adding that Ugandan military aircraft had bombed several rebel-held positions. Uganda says its deployment of more troops and military hardware to Juba this week came at the request of Kiir. Lieutenant Colonel Paddy Ankunda, a Ugandan military spokesman, said on Wednesday that reinforcements were dispatched on Monday and Tuesday “to plug security gaps”. He denied the Ugandans were actively involved in combat. Yoweri Museveni, the president of Uganda, is a strong ally of Kiir. The neighbouring countries have built a bond that goes back to South Sudan’s armed struggle for independence from Sudan and the Khartoum government. Museveni recently warned Machar that East African countries would unite to defeat him militarily if he does not agree to attend peace talks. In essence, Uganda is providing the manpower on the ground while the US, Israel, Saudi Arabia, Qatar and others provide the cash, weapons, and everything else. It is another proxy war, just like the ongoing conflict in Syria, albeit with Ugandan troops literally invading South Sudan to prop up the West’s proxy government in Juba. Who is funding and arming rebel groups fighting the West’s proxy government is still unclear. Reports indicate it may be dissident factions of South Sudan’s own armed forces involved in a recent coup attempt. Other theories suggest that US, Uganda, and/or Israel may be funding and arming both sides hoping to carry the conflict onward to Khartoum. It is clear that Khartoum, Sudan, one way or another, is the US-Israeli-Saudi-Qatari goal – to complete the theft of Sudanese oil as well as the means to export it out of the broken, worn-torn, decimated country. This is the current state of the Wall Street-London global order in Africa – and a tattered, exploited Africa in our future should this state persist.